I was thrilled to be visiting Orlando last weekend - mostly a trip to Universal Studios to Wizarding World of Harry Potter - but there was no way I was going to stick with park food. Orlando isn't quite a foodie capital but I went to my reliable Chowhound for my research, asked some friends who had recently visited the city and landed on one must-visit spot: The Ravenous Pig. 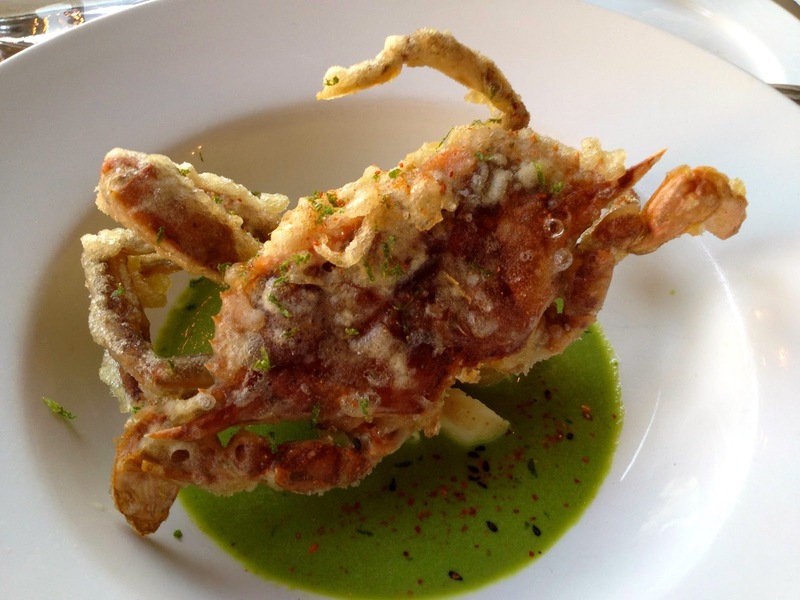 The Ravenous Pig prides itself on fresh and local sourcing, with the menu likely to change from time to time. We wanted to try as many dishes from the delicious sounding menu as possible so we opted for sharing tapa style from the the pub and starters menu and squeezed in a salad. asparagus. The lamb was served with a refreshing lemon yogurt and cucumber-dill slaw. 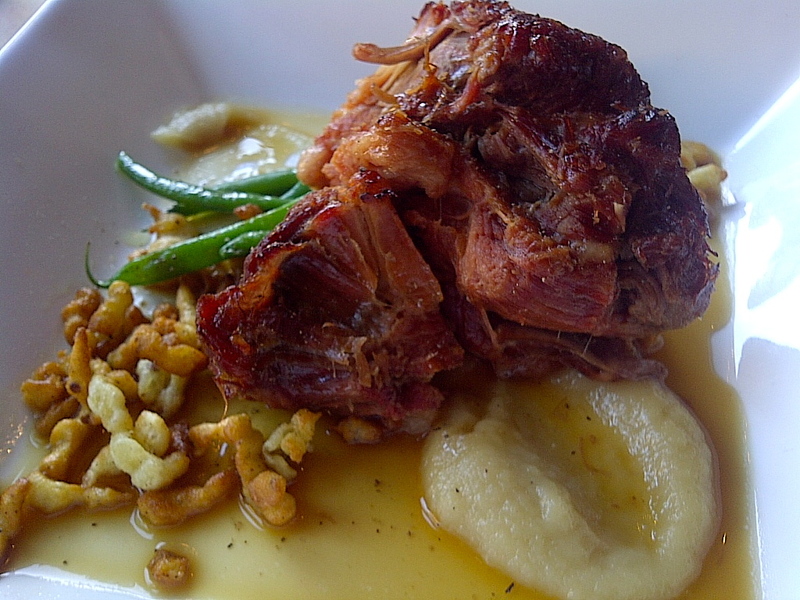 This was one of Tony's favourite dishes, the lamb incredibly tender. 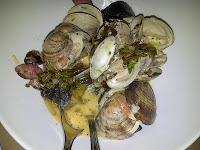 The charred octopus with squid ink and potato salad was good but not extraordinary compared to the rest of our dishes. 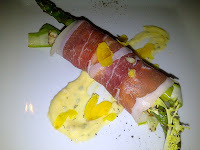 We LOVED the asparagus, which barely qualifies as a salad was it was wrapped in prociutto. The farm asparagus was fresh and crisp, and the accompanying bernaise, almonds and lemon vinaigrette all delicious. 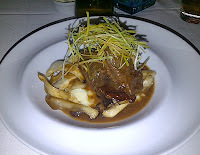 This was my favourite dish of the night. 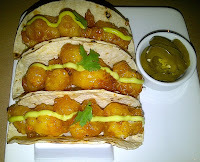 Our server brought our 2nd course of 3: delicious rock shrimp tacos, both meaty and tasty - my second favourite of the night (the asparagus wins on originality of freshness and flavours), shrimp grits with corn and chorizo oil. The shrimp was incredibly fresh and sweet! 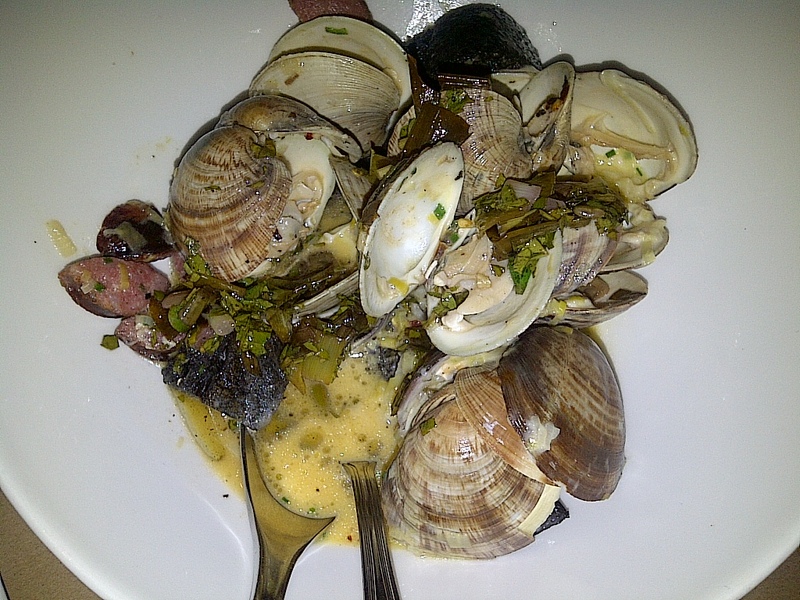 Finally, very tasty clams served in a hearty and delicious broth with garlic sausage, creamed leeks, and squid ink croutons. We couldn't resist dessert and settled on the chocolate truffle cake, I was sold on the raspberry creme fraiche ice cream - very unique and delicious! 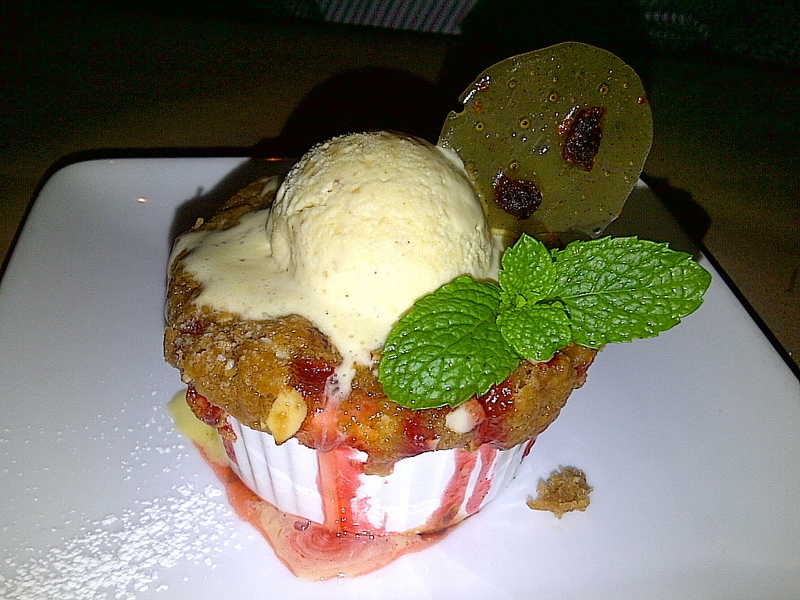 On our server's recommendation, we also had the strawberry rhubarb crisp, served with toffee crunch ice cream. 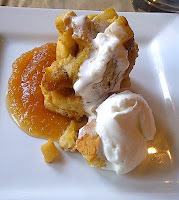 This, too, was also delicious and we enjoyed both homey, sweet desserts. 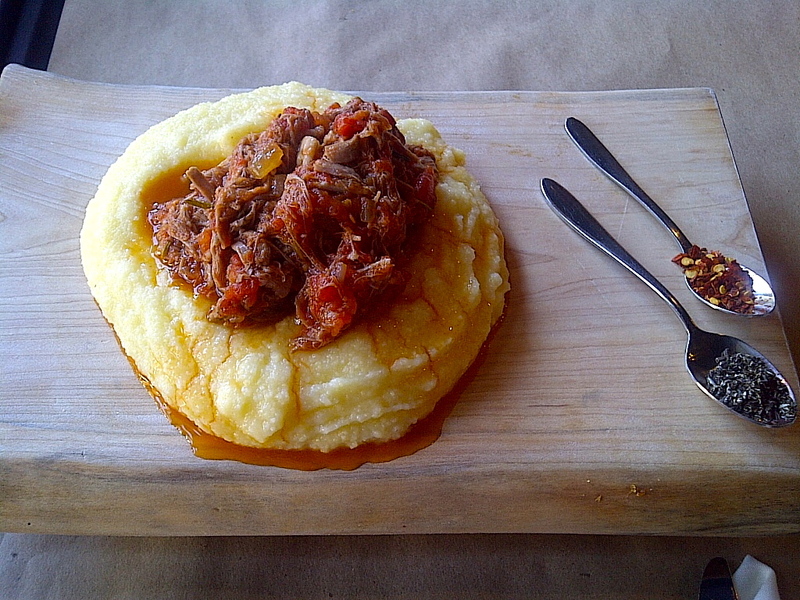 Located in Winter Park, The Ravenous Pig is definitely worth the short drive from whatever theme park vacation you might be taking in - particularly for those who are having an adult visit to the happiest place on earth (or like me, a "magical" one!). This American gastropub is not open Sundays and is always full so be sure to plan ahead! We were surrounded by families, dates, couples...good food is good for everyone :) No wonder our friends opted to visit twice! 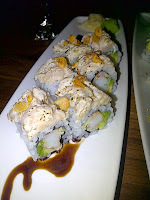 This was the only restaurant consistently recommended by foodies and I am happy to pile on. 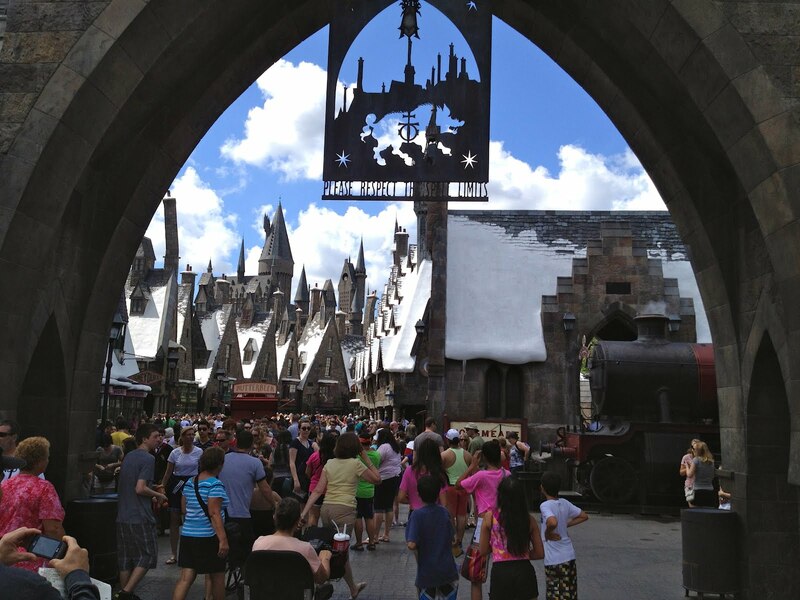 ORLANDO: Tips for Wizarding World of Harry Potter! 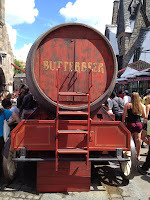 Pardon the divergence from food, but I thought it was worthwhile to share our recent experience at Universal Studio's Wizarding World of Harry Potter! galore at Ollivanders! Don't miss these details in all the windows. The one downside is that "Hogsmeade" is very narrow - while there are many shady nooks to escape the heat, it can be congested and challenging to make it through the village and store to store to see all the details. Honeydukes is definitely worth a stop, where you can pick up cool treats like chocolate frogs, complete with trading cards, every flavour (jelly) beans and more! 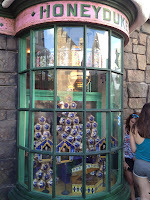 You actually cannot buy a wand at Ollivanders, inside is a demonstration of the wand selection process...but adjacent (and connected) is Dervish and Banges where you can scoop up all sorts of Harry Potter merchandise, including wands! My favourite was Hermione's wand, but it was cool to see all of them. Rarely a child would leave the Wizarding World of Harry Potter without a wand! For ride aficionados, you may be a bit disappointed as there are only 3: Duelling Dragons (a re-purposed roller coaster), Flight of the Hippogriff (a kid friendly coaster), and the star attraction, Harry Potter and the Forbidden Journey in Hogwarts Castle (a motion adventure coaster). 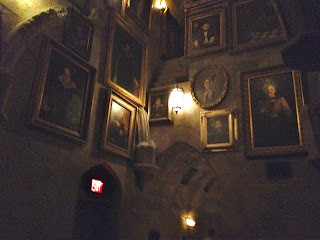 The Forbidden Journey is everything you may have heard or read about it and MORE - it was AWESOME. Like the entire park, it is more than just the ride itself, it is the entire experience of heading into the magnificent Hogwarts castle and walking through the castle to the ride. You'll walk through Professor Sprout's botany green house (with mandrakes behind a cage), experience a gallery of talking paintings, including a Salazar Slytherin, walk through Dumbledore's office and the defence against the dark arts classroom. You'll see the sorting hat and be welcomed by holograms of Dumbledore (in his office) and Harry, Hermione and Ron, including various special effects as they tell you about the journey ahead (we saw it "snow" one time!). Of course, the first time you go through the castle, you may anxiously race through and fear getting behind - we went through the castle 3 times and took time to explore and watch each presentation/skit (you can stand aside). There is also an option to just walk the castle while not going to the ride...but why miss the ride? The motion coaster has 4 seat in a row, and I have to say, each time we went through, we had a slightly different experience - sometimes the dragon breathes in your face, sometimes not. Sometimes you hear the dragon behind you, sometimes you see the footprints as you fly through the observatory. If you're game for the repeat line-up, the repeat is worth it! We did not go on Duelling Dragons but we did take a spin on the Flight of the Hippogriff - it's not a very exciting ride but you do get to see Hagrid's Hut while in line and Buckbeak while on the coaster! Hogsmeade, including a giant barrel in the center...but it is also available at Three Broomsticks (where you can grab breakfast or lunch) and also Hog's Head (there is seating when it's not peak hours inside and out). Carts throughout also sold bottled pumpkin juice, which I was hesitant about before but it was actually quite delicious, tasting largely of the nectarine puree it is made of. Butterbeer comes regular or frozen - it is essentially butterscotch and gingerale (tastes like cream soda), which can be a little sweet, but the frozen version is a very nice dessert and tastes completely different. If you have a chance, I'd recommend trying both! We had one with lunch (the sweet butterbeer was nice balance to my turkey leg) and the frozen served as a nice afternoon snack break at Hog's Head. TIPS: As I mentioned, the Harry Potter park of the park is not big, is by far the most popular and bound to be very crowded. We did some research before going and want to share some of the great tips we learned and discovered. One great site we found was secretsthatmatter.com, where a father writes about his experience in the early days of the park opening. Reading through gives you an idea of the layout and tips to bypass the crowds and lines. Some of the tips are out of date (ie. there is no longer a "no bag" short cut for the Forbidden Journey), but this was by far the most useful site we read. Early Entry is key. As I mentioned, the park is very busy. Early entry, 8am, means you beat the masses at 9am. The best way to secure early entry is to get a hotel package that includes it and stay on-site. The other benefit of staying on-site is that you don't need to bother with transportation. We stayed at the Hard Rock, which is less than 10min walk to the park entrance. When you're getting up early to beat the 8am rush, that closeness is bonus. There are water taxis available at the hotels, but for the Hard Rock...just walk! As we headed out on the path, there were also rickshaws available - we never did figure out if they were free (likely tip based), but they only got you as far as City Walk anyhow which is not a long walk...HOWEVER, the rickshaw ride would have allowed us to bypass some of the others trekking from the hotel. Something to consider for future! We had planned to head out around 7:30am and there were others who beat us out the door...and by the time we arrived, Universal had opened their gates (I was imagining a mad rush as crowds gathered!). - Stay on-site if you can, you get early entry and express pass included (does not work for Forbidden Journey but TOTALLY worth it for all other rides unless you're ok waiting at least an hour everywhere you go...we mostly walked straight up to rides). PLUS, you can send anything you buy inside the park back to your room - no lugging around souvenirs! Yes, I did send my $10 chocolate frog back to the hotel. - Upon entry, head STRAIGHT to Hogwarts for Forbidden Journey, key while the crowds are thin. And if you come out and see no line-up outside the castle, GO AGAIN. It will never be that light again until late afternoon. By the time we came out the 2nd time, there was already a long time. - It is a single line into the castle, and there is a locker area for bags - go without bags if you can (I went fanny pack), this will save you the time and mostly the hassle of getting a locker. - After Forbidden Journey, head straight to Ollivanders. The line for the experience is at least an hour long any time of the day - unlike Forbidden Journey, we did not think it was worth the long wait so you might as well check it out before it gets insanely long. If you have a 2 day park pass, then go first to Forbidden Journey the first day and straight to Ollivanders the second. - Fear not if you miss the early morning, the crowds thin out a bit in late afternoon (long day for kids). We returned around 3 or 4pm and managed to get on Forbidden Journey again. Our deciding factor was whether or not the line extended outside the castle - that's a 90min wait. 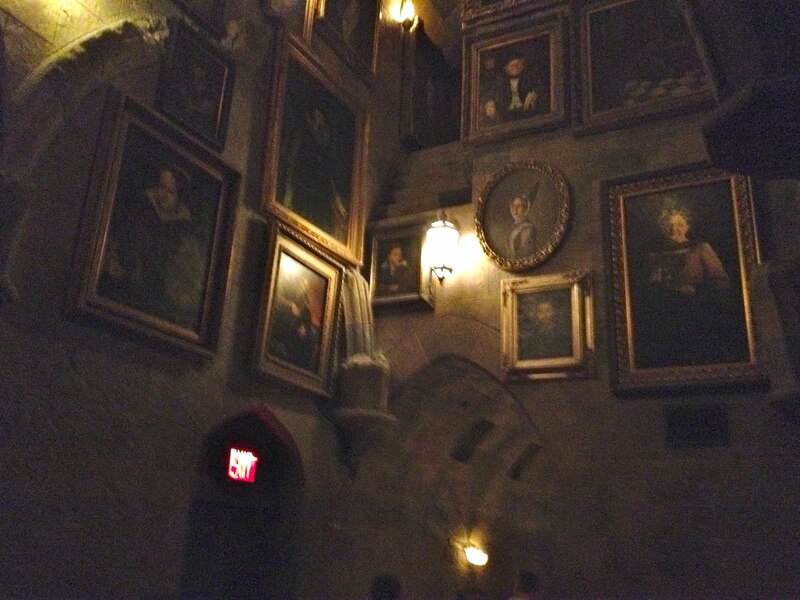 - There is only one restaurant, Three Broomsticks, and it starts to get busy around 11:00am, with line-ups at noon. Beat the rush with an early lunch - get there by 11:00am. - The store next to and attached to Ollivanders is not the only place to get wands, in fact there are many places you can get them so no need to stick out the crowds. For one, there is a cart outside the exit of Forbidden Journey with all the wands. And of note, most of the Harry Potter merchandise is available in the general souvenir store near the park entrance - stop by there on the way out instead. Wizarding World of Harry Potter is definitely a must for any and all fans of the book - even those who are not will likely enjoy for the magical experience. Part of the enjoyment is sharing with all the other fans in the park - young and old, everyone is just excited to be there. How amazing is that? I'd go again and can't wait to see the park expansions planned! Will they build Diagon Alley?? The Burrow? Ministry of Magic? Guess it's too much to wish for a quidditch pitch. OTHER Island of Adventure Attractions: We fully took advantage of our express pass to enjoy the rest of the park (we almost felt bad for all those waiting patiently in line, we never waited for much longer than 10, 15 min). Jurrasic Park is worth visiting, although is a water ride so be prepared to get wet....but not as wet as Dudley Do-Right's Ripsaw Falls (killer are the water guns at the end of the ride that spectators can pay to shoot you direct! Yes, we were victims). The Marvel Super Hero island is also cool, with a 3D Spider Man ride and the Incredible Hulk Coaster. In Seuss Landing, you can experience The Cat in the Hat ala It's A Small World (we found the ride a little jerky). DO NOT go to Poseidon's Fury. It is not a ride, it is a standing theatric experience and anything but thrilling. DO NOT waste your time here. There have been many instances where I searched for best Portuguese in Toronto on a night where we weren't sure where to eat, Chiado has always come up as the best but we had yet to make our way there - it is a fine dining establishment and I always found it a little pricy for just our average night out. 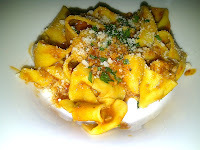 I was happy to have made a reservation for Winterlicious, finally a chance to try it out and see if it's worth it! For our $45 3-course dinner, we had a "bonus" amuse bouche, a fresh cheese served with balsamic and my preference, the honey with rosemary. The cheese was good, not very strong and served at the perfect cool temperature. Our mouths were "amused" indeed. For the first course, I had the lobster and shrimp bisque done with saffron and cognac. It was very tasty and the shell fish fresh in the soup. 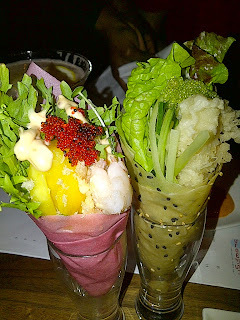 My friend Jen had the salad which was colourful and fresh looking - an enticing salad as any. 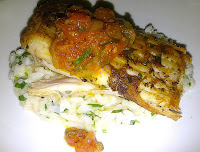 There were a lot of options for our second course but I decided on the pan seared skate fish on coriander risotto. It was AMAZING! The fish was perfectly flavoured and flakey, prepared just...well, perfect. I savoured every delicious bite. 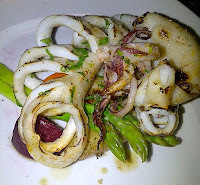 Tony had grilled squid, a popular dish in Portuguese restaurants, tossed simply with garlic and lemon. The thing with squid is not over-cooking and it was done just right, with just enough flavour. Needless to say we were both very happy with our dishes. 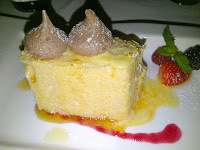 To finish off our meal, we had a white chocolate flan, which was tasty and not as sweet as I thought (since I'm not a fan of white chocolate). Flan is also traditional to Portuguese cuisine so I'm glad we had a taste of that. I tried molotoff for the first time, a traditional meringue dessert that was also well done. We loved our meal at Chiado and can finally claim to know what all the buzz is about. We'd be happy to return to the restaurant at any time and can't wait to try out the regular menu. I had been meaning to check out Banu and was pleasantly surprised to find it on the Winterlicious list so I took the opportunity to make reservations. I don't profess to know much about Iranian food, but it was recommended by my friend Ata and I had trust he wouldn't steer me wrong. We arrived to find Banu a casual chic restaurant on Queen West and greeted by an artsy cool server. I butchered the ordering of every item but he still encouraged me to try. We started with aash e reshteh, a potage (thick stew) of vegetables and buckwheat noodles nd a tasty spread made of olives and pomegranate molasses, which was surprisingly quite filling. 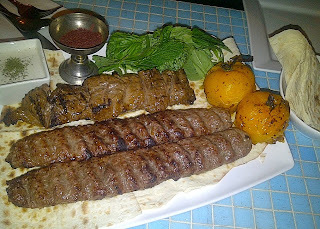 Our main kabob choices were easy: koobideh, ground Angus sirloin, and the torsh, beef tenderloin marinated with pomegranate and and walnut. I love koobideh, the meat falls apart in your mouth. The torsh was prepared perfectly, each piece still a little pink in the middle. It was very tender and tasty! Our skewers were served with thin wraps on the side, to be combined with a light creamy garlic sauce and a turmeric powder on our meat. The desserts did not seem very exciting at first but I have to say, they were ultimately the perfect end to our meal - Soma dark chocolate with pomegranate pieces and Soma gelato in lemon sour cream flavour. Somehow the dark chocolate was just the right taste to wrap up our delicious dinner. The gelato was a little stronger than I had imagined, although I am still glad we tried the very unique flavour of gelato. As I look through Banu's regular dinner menu, I'm intrigued by other kabobs like calf's liver and cornish hen with saffron. For the adventurous there is also cow's heart and lamb testicles marinated in vodka....do you dare? I just might when I return!